Eight people have been rescued from a Cambridgeshire business during a crackdown on modern day slavery. 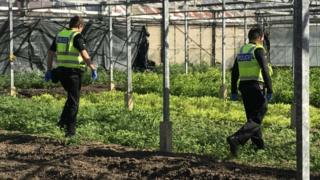 A specialist police team, including the National Crime Agency (NCA), carried out a search warrant at a farm in Old North Road, Kneesworth, on Friday. The victims were discovered living at the site and working for "little or no money", and "in cramped and poor conditions", police said. No arrests have been made and police have not named the business involved. The warrant was carried out by the Eastern Region Special Operations Unit (ERSOU), the NCA and the Gangmasters Labour Abuse Authority - and included police and fire officers as well as officials from HM Revenue and Customs. The hamlet of Kneesworth lies next to Bassingbourn on the Cambridgeshire-Hertfordshire border, near Royston. Police said the "vulnerable" victims - whose gender, ages and nationalities have not been revealed - had been taken to a centre and were receiving safeguarding support while the investigation continued. Det Chief Insp Lee Davies from ERSOU said: "Modern day slavery can come in many forms and is happening in plain sight across the country every single day. "Protecting vulnerable victims from any type of exploitation is always at the heart of what we do, and we will continue to work alongside our partners to keep people safe."